LaShelle Bray is a classically trained soprano and is a local singer, conductor, and music teacher. 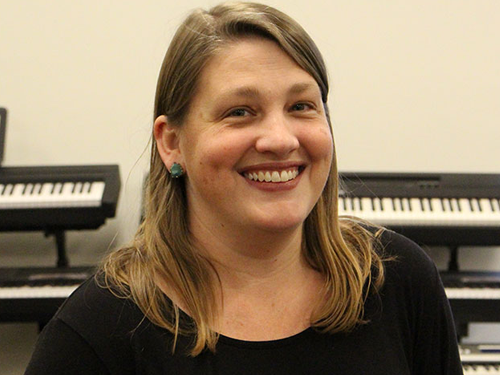 She graduated from Towson with a Bachelor’s in Music with a Vocal Tract. She also earned her AA in Music from Harford Community College. LaShelle’s love of singing began as a child where she sang in school and church choirs before taking a break to stay home with her children. LaShelle is currently the Lead Vocalist at Grace Community Church in Kingsville where she works with the vocalists on the worship team to build them up to sing their best each Sunday morning. She is also conducts a group choir and an acapella choir. LaShelle also teaches courses on learning to read sheet music. While at Towson, LaShelle had the opportunity to be involved in several operas where she was able to grow as a stage performer and singer. She played the role of Mimi in la Boheme, understudied the role of Pamina in The Magic Flute, and performed in recitals and other productions. Her final semester, she was able to participate in a performance celebrating African-American composers and writers. She has also participated in Little Patuxent Opera Institute at Howard Community College two summers in a row where she explored roles from Carmen, Candide, la Traviata, and more. LaShelle also got to work with James Harp and the conductors of Young Victorian Theater Company here in Baltimore performing Gilbert & Sullivan’s The Gondoliers.